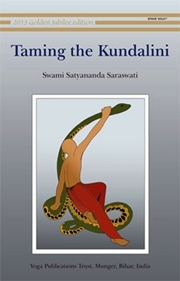 Taming the Kundalini is a collection of letters written by Swami Satyananda Saraswati to a close disciple, during the period 1959-62. Through this detailed and intimate account of yogic and spiritual training, the reader is given a rare glimpse into the unfoldment of the guru-disciple relationship and the implementation of progressive sadhana as a powerful tool to awaken consciousness. Swami Satyananda Saraswati hardly needs any introduction.Many of his books carry five star ratings and the best of the best sellers being Asana Pranayama Mudra Bandha. Born in 1923. Swamiji was a disciple of Swami Sivananda. At the young age of 33 he founded the Bihar School of Yoga.The only Institute of it's kind, Swamiji helped it to gain international stature and many of the Yoga Institutes world over are affiliated to this premium institue at Munger Bihar,India. Since 1988 he is living as a paramahansa sannyasin.He has authored over eighty books.